All the bike magazines do helmet reviews. They get the reader all excited about the new Shoei, Aria, AGV, Nolan, Caberg or whatever. So that weekend the reader gaily rides to his local helmet shop to buy the super new model. He gets there and tries on the medium. It's quite tight across the forehead so he tries the large. This one is ok across the forehead but it rattles around loosely on his head. There is no in between, the fact of the matter is this make and model of helmet is not the right shape for his head. Disappointed, he leaves. Every manufacturer and every model of helmet is slightly different in the way it fits. Personally I have a liking for the mid-range AGV helmets. 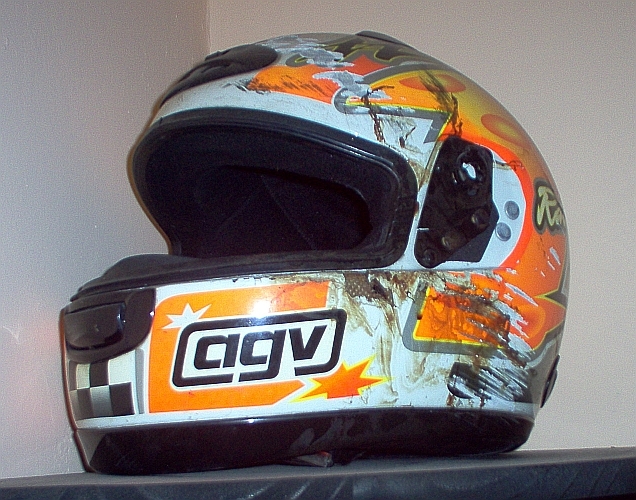 I initially had no brand loyalty to AGV and no particular desire to own one. But there I was in a shop many years ago trying on all kinds of helmets to see which one fitted the best. The best fit was AGV. I have owned 5 or 6 AGV's since then. And some people cannot even get their head inside an AGV. Everybody's head is a different shape. I always wanted a particular Shark helmet but it either rattled round on my noggin or my nose was squashed firmly into the chin piece. Gutted, I tried on another AGV and bought that. Fit is the most important thing when buying a helmet. It is better to purchase a cheap helmet that fits perfectly rather than an expensive one that fits poorly. How the helmet fits is critical to protecting your head in the event of an accident. Loose helmets will move around or even fall off, a helmet that fits tight in one place will put all the force into that one place. A helmet should be a snug fit ALL OVER. It should also be comfortable. It is best to avoid accidents full stop, a bad fitting helmet can be a distraction that leads to the accident that tests your helmet. In the UK any helmet used on the road must meet the European standards. Make sure the shopkeeper shows you it's "E" mark. After that try on a thousand makes and models to see which is the best fit FOR YOU. Once you have found the perfect fit I recommend trying to buy a bright colour in that model, give the plonkers in the tin boxes the best chance to see you. And the last piece of advice...try your absolute hardest to avoid testing out your helmet. great advice, ride hard and stay safe! Thx for the advice. keep it between the hedges. Thank you for your advice. I was browsing around for motorcycle helmets when i found your page. I'll click an adsense ad as a way of saying thank you. Thanks great advice, just wish shops would let you test drive some helmets. you can take any bike out that costs thousands but not helmets that cost just a couple of hundred almost ironic!! Your advice is spot on. I,m looking for a new helmet right now, Can't get a helmet that I like and is a good fit so after 6 months still looking. and like you have tested out a helmet !!! no fun. I was talking to a bike shop owner a few days ago and also suggested demo helmets but he said to expensive. (the manufacturer could supply them free to shops) so I jokingly suggested a small wind tunnel big enough for your head and shoulders. Great advice. The new SHARP tests seem to be a step forward. I have a Shoei XR-1000 but was disapointed that it was only 3 stars. And you can't seem to access the detailed test results to see where the weeknesses are. It would allow me to avoid certain objects when crashing (Joke.) Happy riding. I need to buy a motor scooter helmet? If I buy it from an on-line store, how do I determine the right fit. Must be DOT approved, too. Who makes a good scooter helmet? Does a full face visor or over the eye visors take the place of wearing safety glasses or goggles? Thanks. I'm thinking about learning to ride a motorbike, and this is the best piece of advice I've seen about choosing a helmet. Thanks for the tips! Really useful practical advice which is hard to find. I expected more money equals stronger helmet but clearly not the case. I would have been in danger of spending more and thinking I was safer. Thanks very much. My biking tip would be this, choose a white helmet, they are more visible to car drivers and they reflect sunlight in summer which should help keep your head cooler in summer. Also in the summer months, if the helmet has an internal sun visor then you can ride round town with the main visor up and the sun visor down letting in oodles of fresh air but still giving eye protection, great. 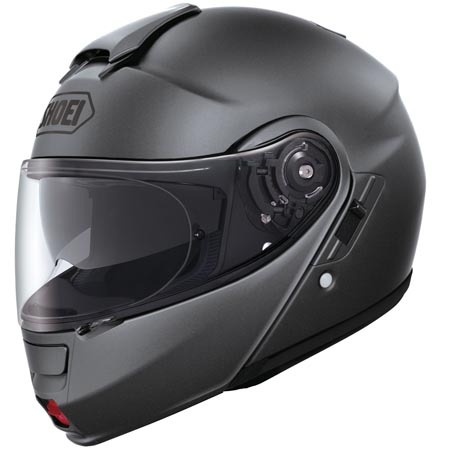 Shoei Neotec is a best motorcycle helmet in my own reviews. It has a strong and hard shell. It also have features that the riders need in the road example anti-fog ans sun-shield. I used to really struggle to find a helmet that fitted until a dealer got me to try on an Arai and it was like putting on an old pair of carpet slippers. I've tried lot's of other manufacturers as Arai's are so expensive but keep going back to Arai because they fit my head. All our heads are uniquely shaped. I've been fairly lucky that my head seems to be AGV shaped and AGVs, while not cheap are at least affordable. I know Arai helmets are expensive. It is worth noting though that for myself not all the AGV models have been a good fit which indicates that from model to model the fit can change too. Just because previous Arais have fitted it doesn't guarantee the next model will. As such whenever you're in a place that sells motorcycle helmets it's still worth trying on new and varied models. You may just find that company ABC's new XYZ model is also a great fit. I'm due for a helmet replacement and quite fancy a 'flip front' type this time...anybody here got any experience with this type? I'm currently wearing a Caberg Ego... which seems easy to type in, ahem! ;) ... which I've been very happy with and I thought the logical replacement would be the Caberg Duke, but it's a different shape and my nose touches the top of the chin bar! If it helps, I'm looking in the £100 to £200 price bracket and have noted Ren's points above. Never used a flip front helmet, sorry can't be any help there. You've clarified my point though that just because one Caberg model fits it isn't a certainty that other Caberg models will fit. Thanks CrazyFrog, l'll add the MDS to the list of possibles (I'd not heard of them before) and see if I can find one local to me to try on.